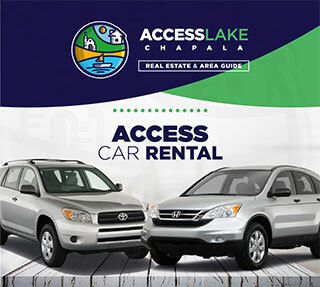 I took an eight day vacation with my friend Tammy from Lake Chapala to Puerto Vallarta and San Blas. We were told that the best way to drive was through the mountain towns (which is the “Libres Roads” instead of the “toll roads”). 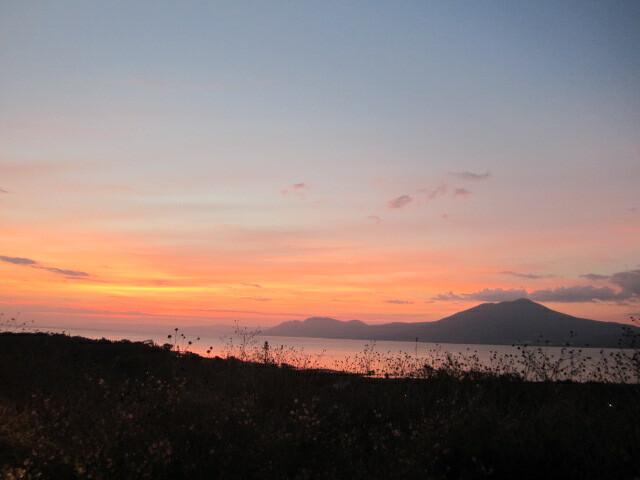 We left at sunrise and didn’t make it to Puerto Vallarta until eight hours later. I would not recommend going that way. It was over the mountains on a very bad road. Potholes were everywhere. Our truck heated up and even got out of alignment. One new tire became bald on the sides. We weren’t sure we were going to make it.But the views were spectacular. We had plenty of opportunities to take photos as we sat along the roadside waiting for the truck to cool down. Below is a photo of one of our stops. 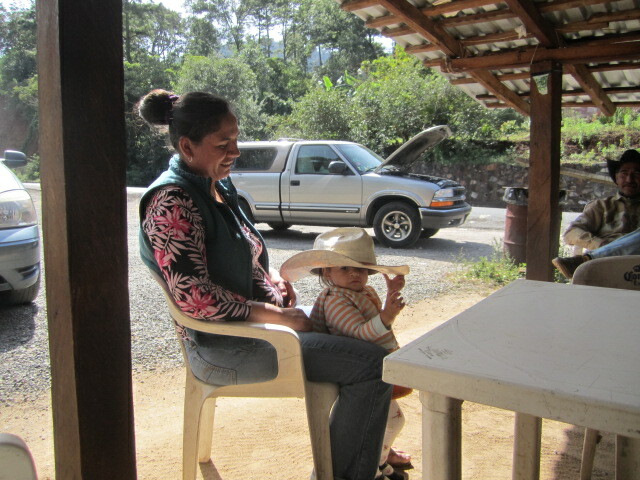 The Mexican owners of the little store were very friendly. The man put water on our tires and in our radiator. They mostly just sold beer and snacks. I enjoyed relaxing with them for an hour and sipping on a beer. Tammy had a coke. The little girl entertained us with her hat tricks. 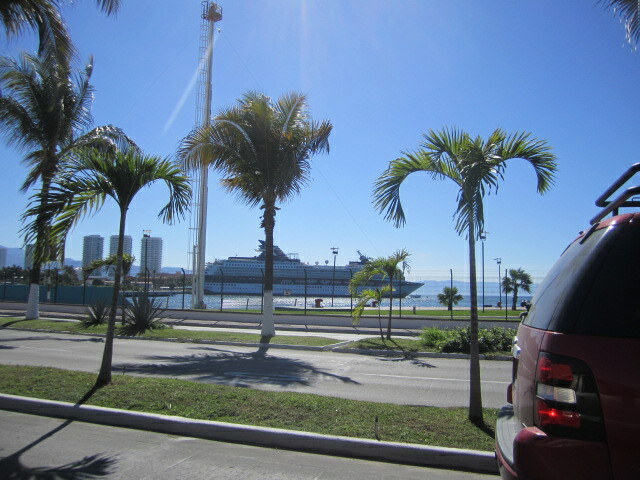 During the five days that we were in Puerto Vallarta, we saw two cruise ships come into the harbor. From November through February there are eight and nine cruise ships a month but in the summer months there are none. The town is very quiet in the hot season. It was in the mid eighties when we were there but the humidity was forty three percent. That is what makes it hard for people, like me, who are used to the beautiful weather in Ajijic. Since we are over five thousand feet high, we don’t have that humidity. 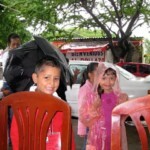 In the summer time it gets into the eighties in both San Blas and Puerto Vallarta but the humidity can be eighty percent. Not many people visit either of those towns in the summer. We checked into our hotel, the Westin. 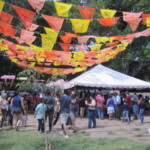 It is in Neuvo Vallarta. I was impressed. 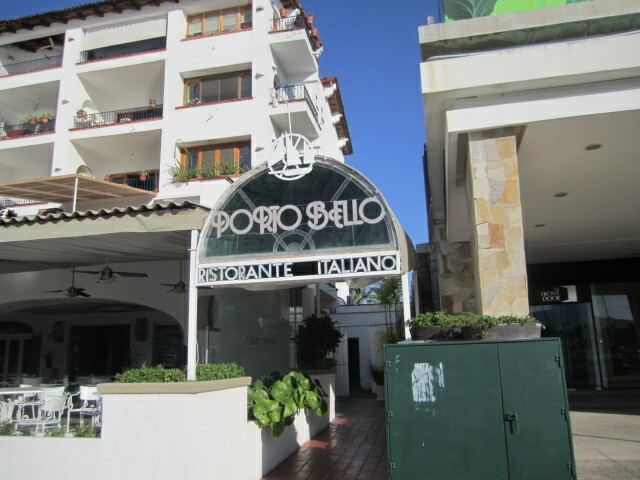 I had never stayed in a nice hotel in all my visits to Puerto Vallarta. I always stayed in the inexpensive hotels in the old part of town. We visited one of those hotels and the price for a night had gone up from fifteen dollars to forty dollars. But it was eight years since I had stayed there. 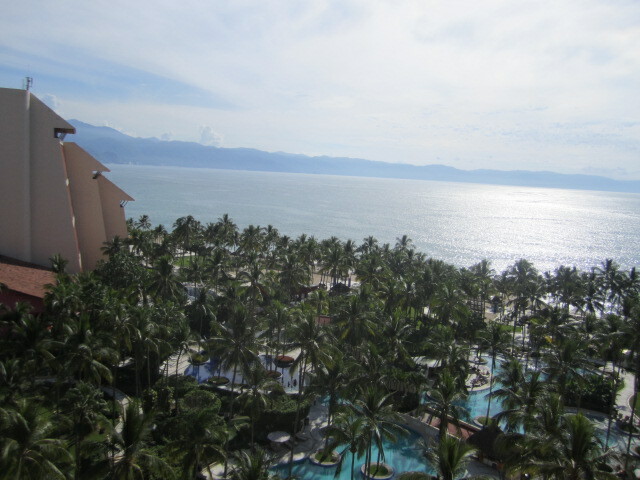 All of Puerto Vallarta is much more expensive. Life goes on but it is sometimes hard to give up old memories of a place, the way it was in the past. We had a room on the eleventh floor. Below is a photo of our view from our private balcony. You can see all the beautiful swimming pools. Since I love to swim, I had a great time. Most of the pools are very shallow. You have to be careful not to knock into the sides where the palm trees are contained. It is best just to use the pools for floating. 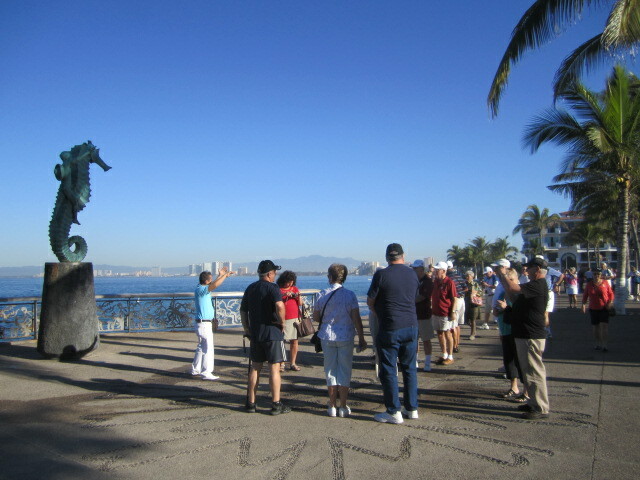 We walked around Puerto Vallarta the next morning. It wasn’t hot yet and many people were out enjoying the beautiful weather. I imagine that some of them were from the cruise ship. There isn’t much beach anymore. 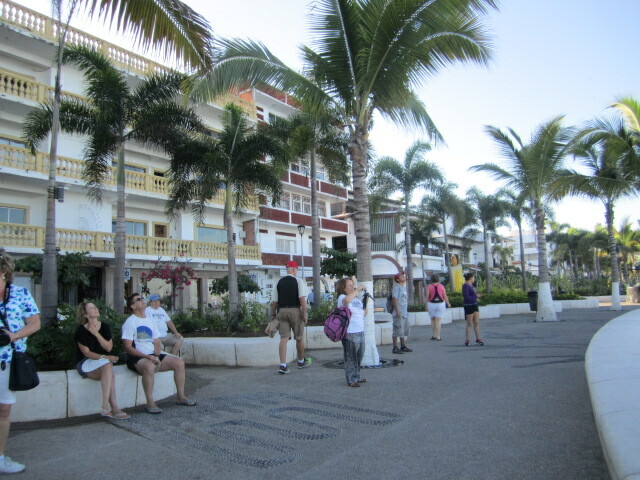 It is mostly covered over by the large malecon. 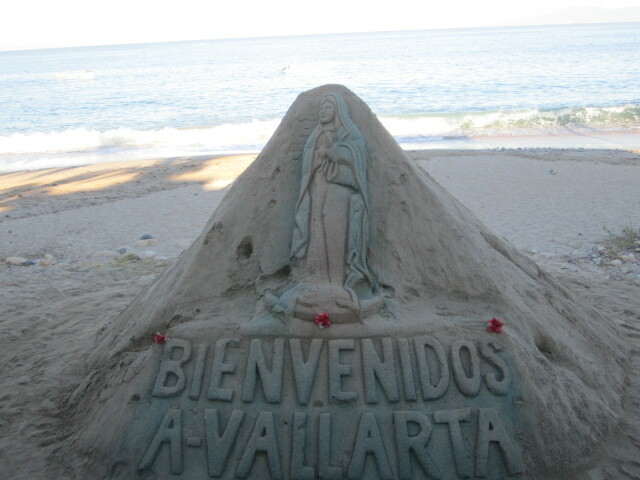 Some of the Mexicans were still in the business of making sand castles on what beach was available. 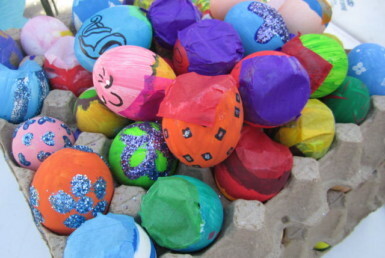 They were very creative. They had tip cups out but not many people stopped to contribute. Maybe they didn’t want to walk out onto the sand. 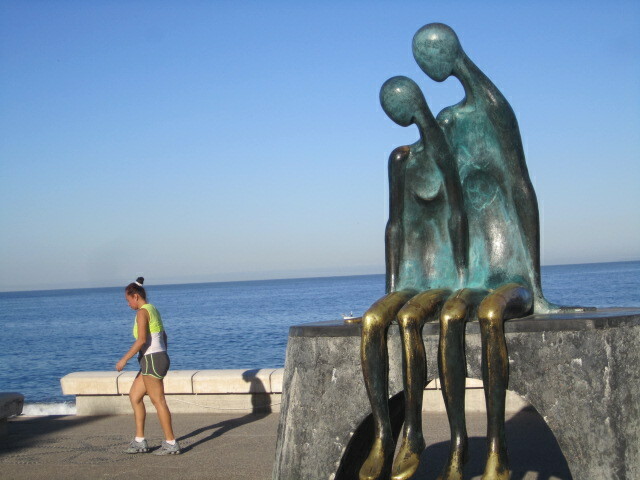 There are also many sculptures on the malecon. I love the one in the photo below. The man and woman appear to be watching the walker. Notice how bright their legs are from being rubbed so much. 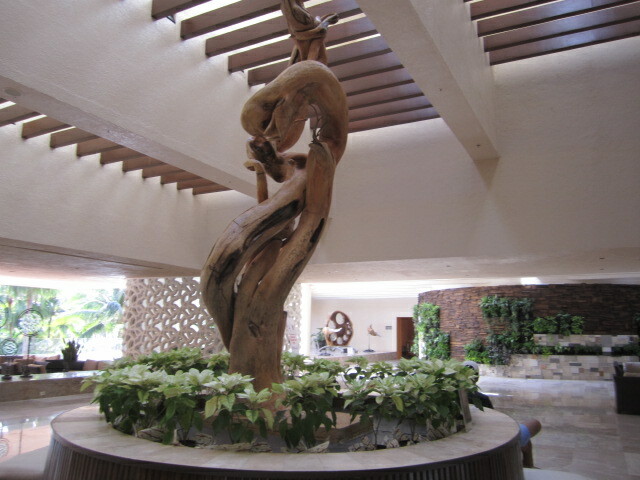 The sculpture below was the closest we got to seeing the folkloric dancers. We weren’t there long enough to see a show but I loved this sculpture. It looked so lifelike. People in the photo below were looking at the Indians who were swinging on a pole. The pole was about 200 feet high. After they climbed to the top of it, they attached themselves by ropes and then were slowly lowered to the ground while swinging in a circle. Quite impressive. Another Indian walked in the crowd and asked for tips. Seemed like a hard way to make a living. I think I would have preferred making sand sculptures, even if the tips were less. The photo below was taken when they are almost on the ground. This would not be a job if you liked to drink at night. Can you imagine doing that with a hangover? 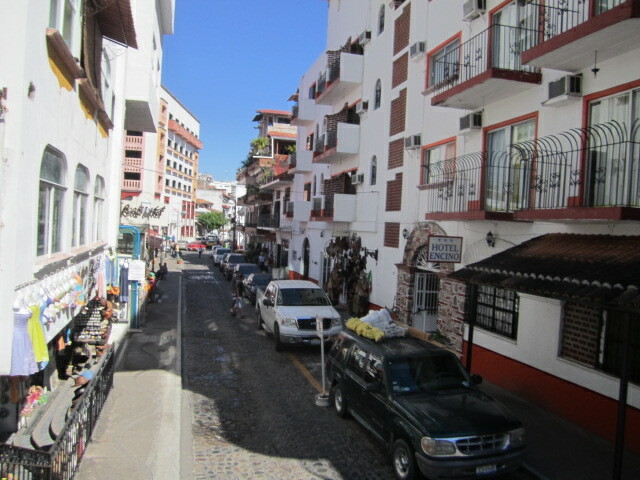 Below is a photo of one of the streets in the Zona Romantica. There are many local buses and taxis that travel these streets. If you drive, it is hard to find a parking place. Going into one of the parking lots is a lot easier than driving all over town looking for a place to park. But those lots aren’t cheap. Better to take a bus or taxi. 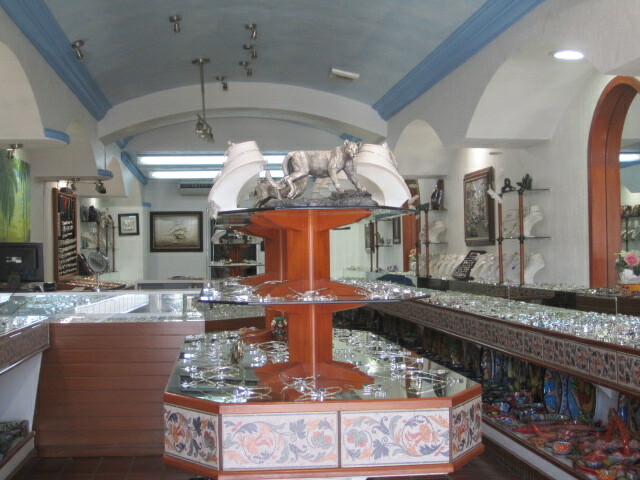 There are hundreds of craft stores all over Puerto Vallarta. 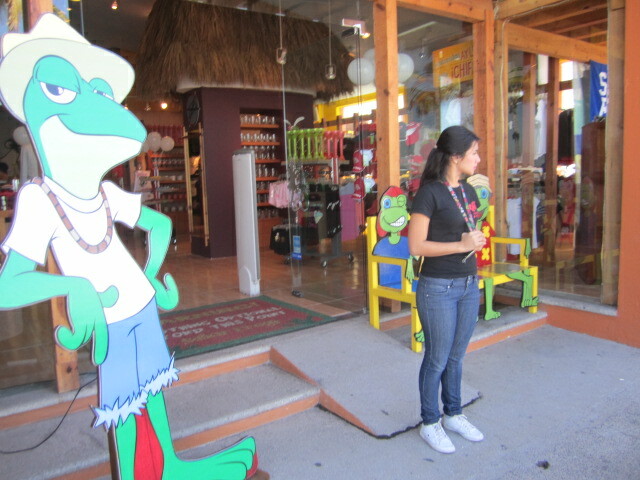 The barkers stand in front of their shops and try to get you to go inside to look around. 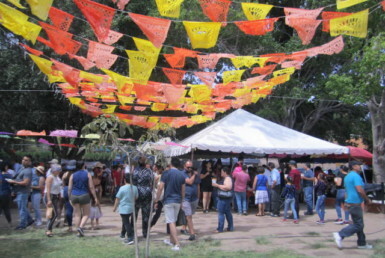 Crafts made all over Mexico come into the shops. I love seeing all the beautiful things. 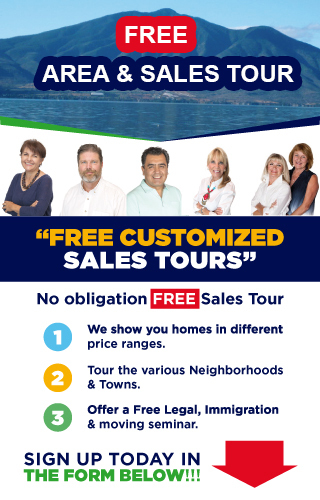 Many places are are willing to bargain but they start high. 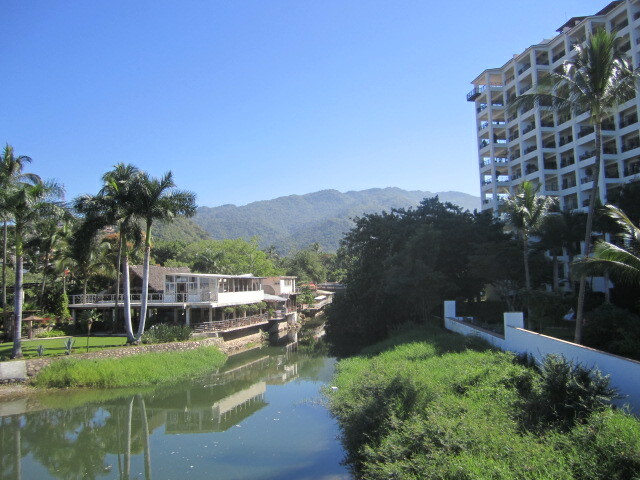 Below is a photo of the Cuale River that runs into the ocean and separates the Romantic Zone. 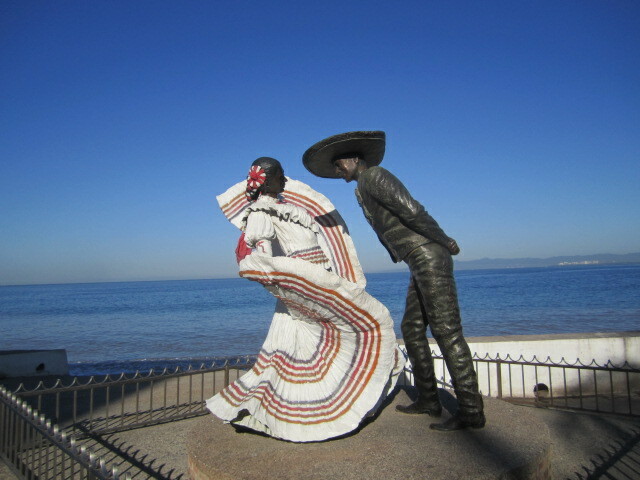 Puerto Vallarta and San Blas are both on the Bay of Banderas with the Sierra Madre Mountains behind them. 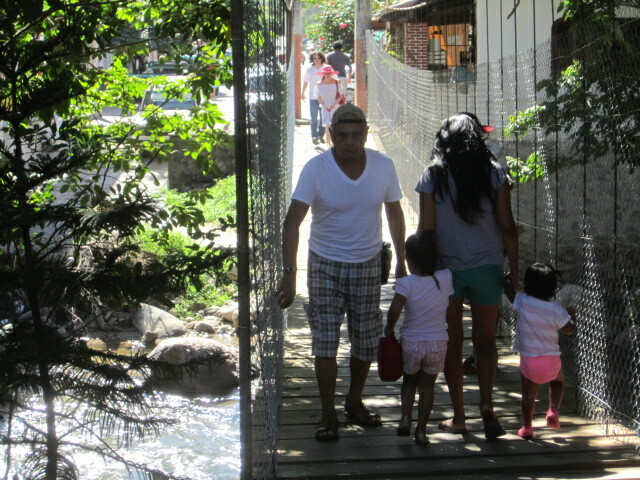 We had to walk over this wooden bridge to get to the other side of the river. It was fun but a little scary. Best not to walk side by side but in a line and not close to anyone else. 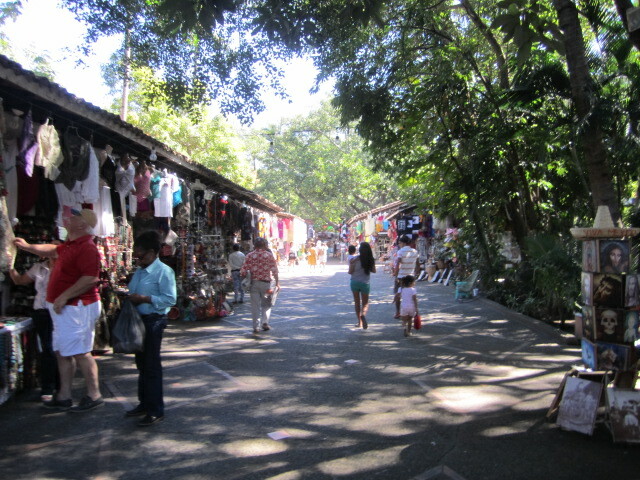 There are many gift shops located along the edge of the river. 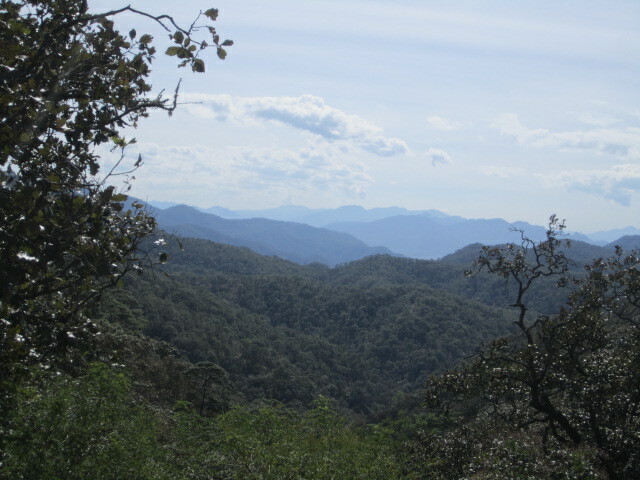 It is also very cool there which is a welcome relief. Even in the winter, it can be hot near the beach. 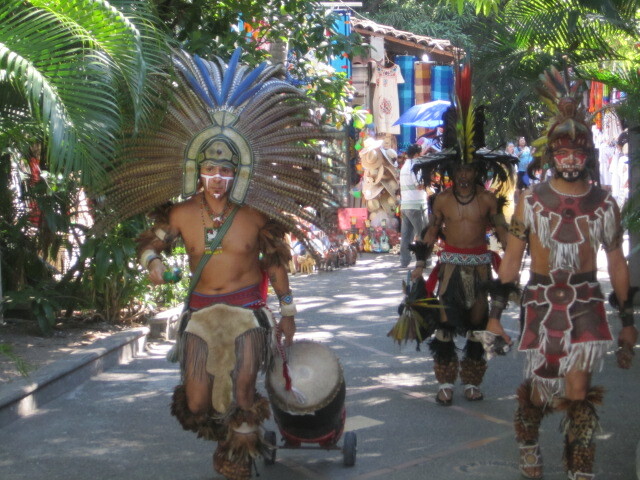 The young men in the photo below were dressed for dancing but we didn’t follow them. Too much to do. Too little time. Music is everywhere. On the street, in the restaurants and stores. This was a good group but we had to move on. We were meeting up with a friend who now lives there. 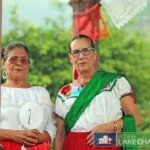 At one time she lived in Ajijic. We had a nice lunch with her. She seemed happy to be living in Puerto Vallarta. But of course she doesn’t stay there during the summer months. She goes up to the States during that time. She lives in an apartment just off the malecon and it is very comfortable. Her rent is reasonable for that area, five hundred American dollars a month. Before we left Puerto Vallarta, she fixed us a delicious dinner there. The musicians that I heard were all of high quality. 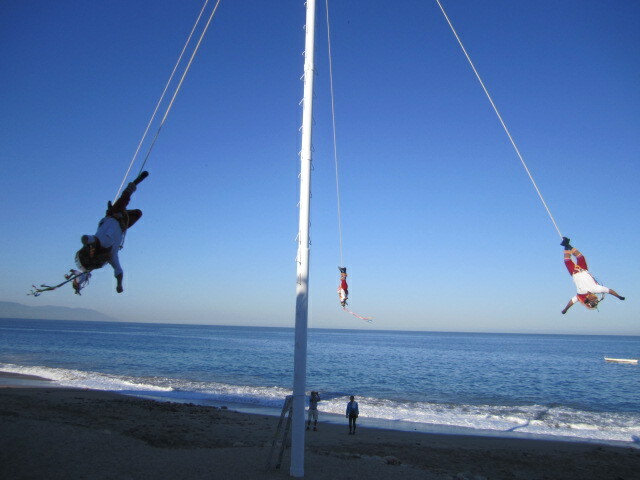 There is a lot of competition for work in Puerto Vallarta. 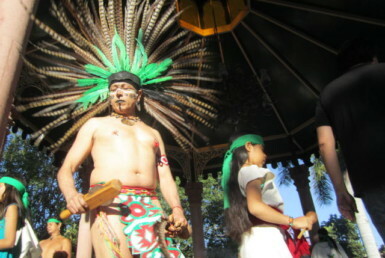 Mexicans stream in from all over Mexico, looking for jobs. It is almost a necessity for them to speak fluent English. The young woman standing in front of the above store was a barker. She had help from the frog signs. We didn’t have time to go inside so I am not sure what the store was selling. 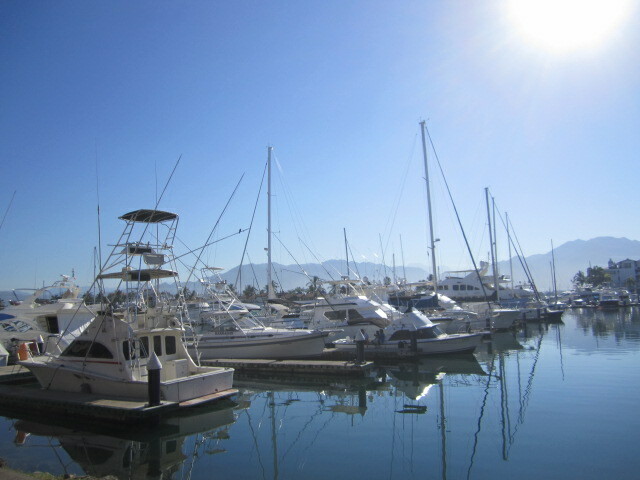 There are many boats in the yacht harbor and they are in the process of building even more slips. When I last visited the harbor eight years ago, there was nothing around it. Now there are shops and restaurants everywhere. 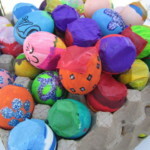 It is an interesting place to explore and if you get tired, stop in for a massage. I had one. It was relaxing. There are massage places almost every few doors. 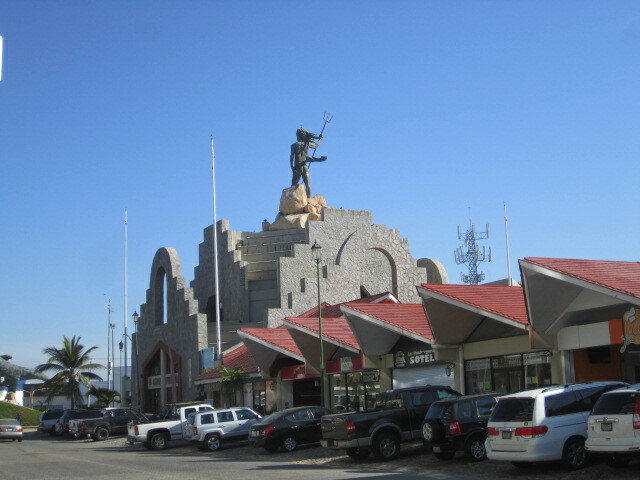 The sculpture of Neptune in the photo above has been there for many years. It guards the entrance to the yacht harbor. They have both inside and outside seating. 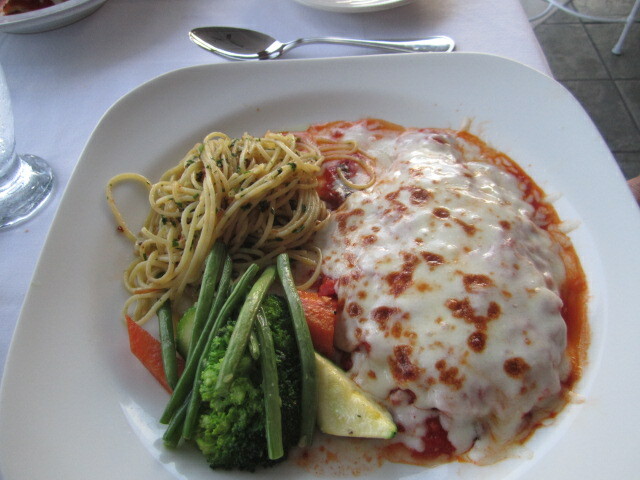 The lasagna below is only half an order. My friends split it. But that half order was almost enough for two meals. 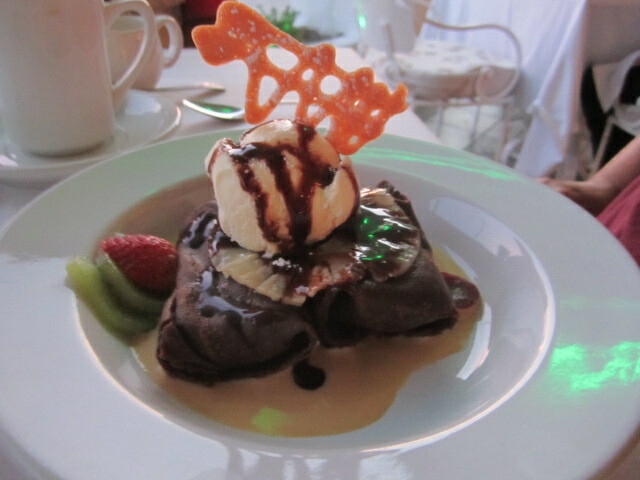 The cooks get very creative with their desserts. Besides being beautiful, this one was also delicious. 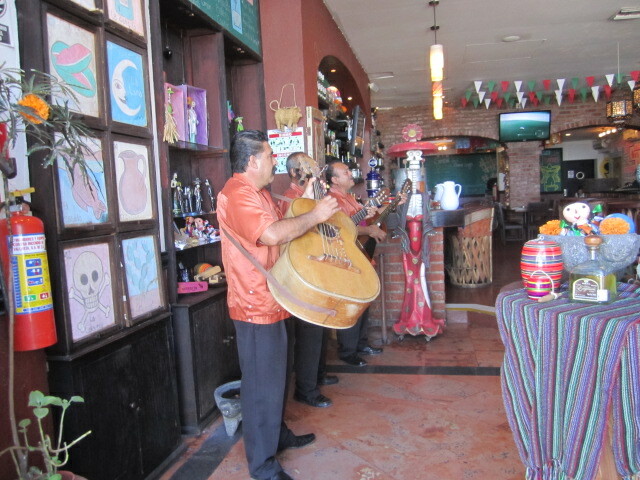 I had a lot of fun during our brief stay in Puerto Vallarta. I had a bit of a problem with the humidity but for such a short period of time, I could handle it. I certainly wouldn’t want to visit during the summer months. Tammy said she was there last year for two days in September and she never left her hotel. The swimming pools were even to hot to use. We almost got roped into sitting through a time share presentation but we came to our senses and canceled. There are no more time share hawkers, always trying to get people to sign up. Maybe they made it against the law for them to stand on the street corners and accost people. Sometimes change is for the better. 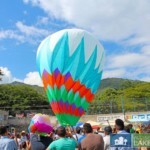 If you haven’t been to Puerto Vallarta, it is well worth the visit.